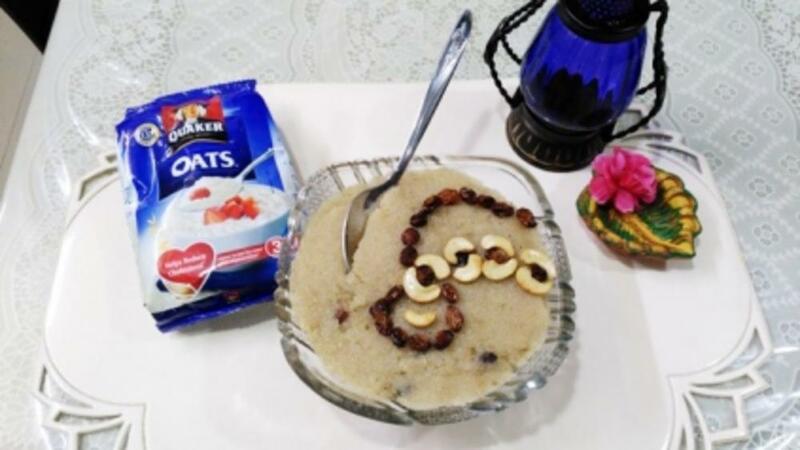 Sheera Oats – The Perfect Divine Food. Sheera is a very popular instant swet dish made in every Indian home on regular basis. It is made and served as ‘prasad’ or ‘prasadum’ in most religious functions and auspicious ceremonies. It is also an easy to make, nutritious breakfast. Depending on your taste and requirement, the sweetness and consistency can be altered. Can be fed to toddlers and old people too. Make it more nutritious for your loved ones by making it with oats and sooji in the ratio 50:50. That is, for one cup of sooji you take, take one cup of roasted and powdered oats. Now follow the recipe given below and make every auspicious day more healthy and nutritious with the goodness of oats. Even the gods will be impressed by the smart mom in you!! 1. Heat a pan on medium heat and pour in the ghee. 2. Allow the ghee to heat up and then fry the cashews, raisins and the almonds separately till golden and remove it in a small plate. 3. Then add in the roasted sooji and oats (powdered) and cook in ghee till it turns golden in colour. Remove it on a plate. 4. Now pour 4 cups of water in the same pan and bring it to boil. To this add a pinch of salt, ¾ cups of sugar and ¼ tea spoon of cardamom. Wait till the sugar dissolves. 5. Now lower the heat, add in the oats and sooji mixture and keep stirring till it reaches the desired consistency. 6. In the end, add in the raisins and nuts, mix well and cover it. Serve hot or cold – the way you like it..
Munthiri Kothu – Moong N Oats Ladoo.